Last week saw a quickening pace of sea ice melt, with key regions displaying rapid loss of ice. Most rapid melt occurred in the Barents Sea which saw major ice losses both to the north and south of Svalbard, north and south of Franz Joseph Land, with a large polyna opening to the north of the island and more gradual melt to the south and west of Novaya Zemlya. Other regions showing rapid melt included the Bering Sea and the Sea of Okhotsk. Most sea ice in the Okhotsk region has been driven shoreward with Bering ice rapidly melting in the southeast and the entire ice pack there showing thinning and opening polynas. The Fram Straight and Baffin Bay showed more moderate rates of ice recession. 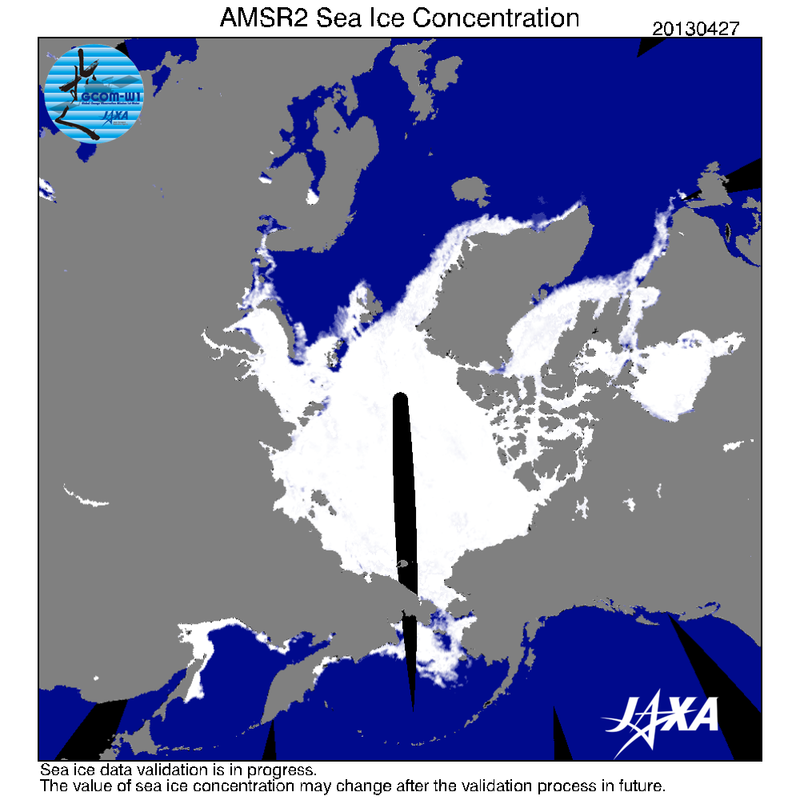 Overall, sea ice extent, according to the Japanese Space Agency (JAXA) is currently at 12.86 million square kilometers. This measure is tracking just below values for 2011 for this time of year. Sea ice area also showed more rapid melt this week with values falling by 400,000 square kilometers over the past seven days to reach 12.56 million square kilometers yesterday. Average rates of daily loss remain between 50,000 and 70,000 square kilometers for area with the pace picking up to around 90,000 square kilometers per day at week’s end. The pace of loss for both area and extent remain above average for this time of year, matching the extreme rate of loss that began to emerge during 2012 at this time of year. Furthermore, all the latest measures show sea ice volume remaining at or near record low levels while multi-year ice coverage is at lowest levels ever. Loss of Arctic snow cover and corresponding river melt for this time of year also accelerated. 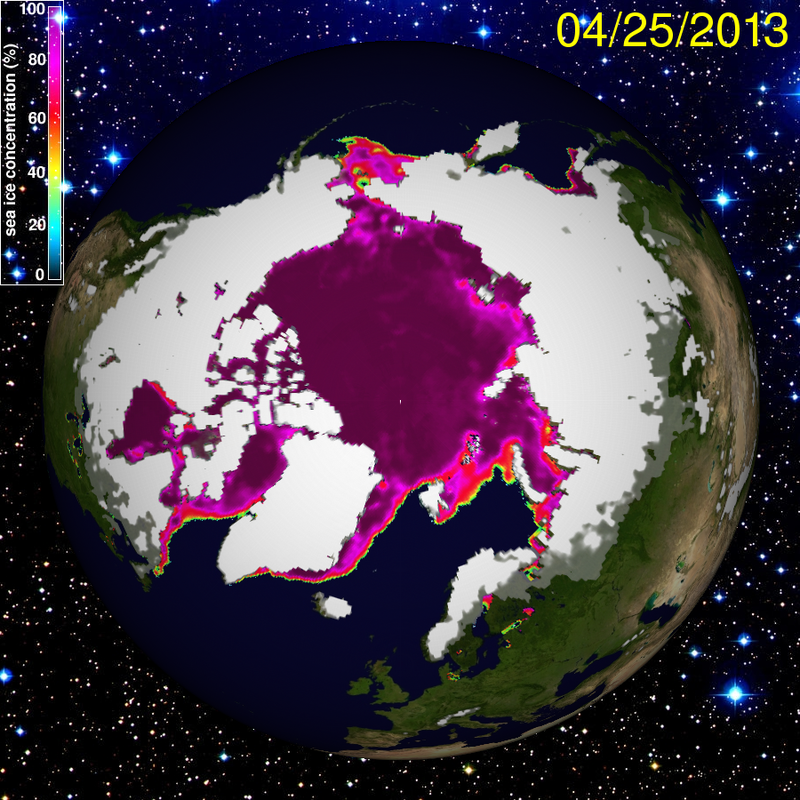 Areas near Hudson Bay, in northeastern Europe, and central Siberia showed the most rapid melt. As snow melt accelerates, rivers fill with warmer melt waters that then flush into estuaries and the ocean. This snow-melt flushing warmer water into the ocean usually pushes melt faster during May and June. This year, the process appears to be happening at least two to three weeks ahead of schedule. Above-freezing air temperatures continue to advance northward. Air warm enough to facilitate large-scale melt has invaded most of Siberia and Northern Europe. This week also saw above freezing air temps regularly pushing north toward Svalbard and into the Barents sea. The Sea of Okhotsk has seen above freezing temps for much of the week, with the Bering Sea also experiencing above-freezing air temperatures. In Canada, the melt line has regularly advanced into Northern Quebec, covering southern portions of Hudson Bay. The southern tip of Greenland also shows consistently above-freezing temperatures. Colder air, however, remains entrenched over north-central Greenland and over the northern portion of the Canadian Arctic Archipelago. Average air temperatures in the high Arctic remain well above normal for this time of year with today’s values showing temps between 6 and 7 degrees Celsius above mean for most areas. In the context of this report, it is worth noting that sea ice melts at around -1.9 degrees Celsius. So near freezing or above freezing air temperatures are usually enough to promote melt. Ocean temperatures beneath the ice hover at or above the freezing mark as well. So the ice is under stress not only from the surrounding air, but also from beneath as warm water upwelling events have become more frequent. Sunlight is also now a constant in the Arctic. So any open water areas, showing dark ocean, will tend to rapidly absorb heat. In addition, an unprecedented number of leads have shot through the ice this winter and spring. These crack are both darker and warmer than the surrounding ice. So weaknesses are likely to begin to appear as warming starts its more rapid cascade over the coming weeks. As noted above, warmer than freezing sea surface temperatures compose one of the main forces promoting ice melt. The above graph, provided by NOAA, shows expanding regions of above freezing (sea water) surface water in Hudson Bay, The Canadian Arctic Archipelago, in a region of the Arctic Ocean north of Alaska and Canada, the Bering Sea, the Sea of Okhotsk, in multiple areas over the East Siberian Arctic Shelf, and in a growing region of the Barents Sea. 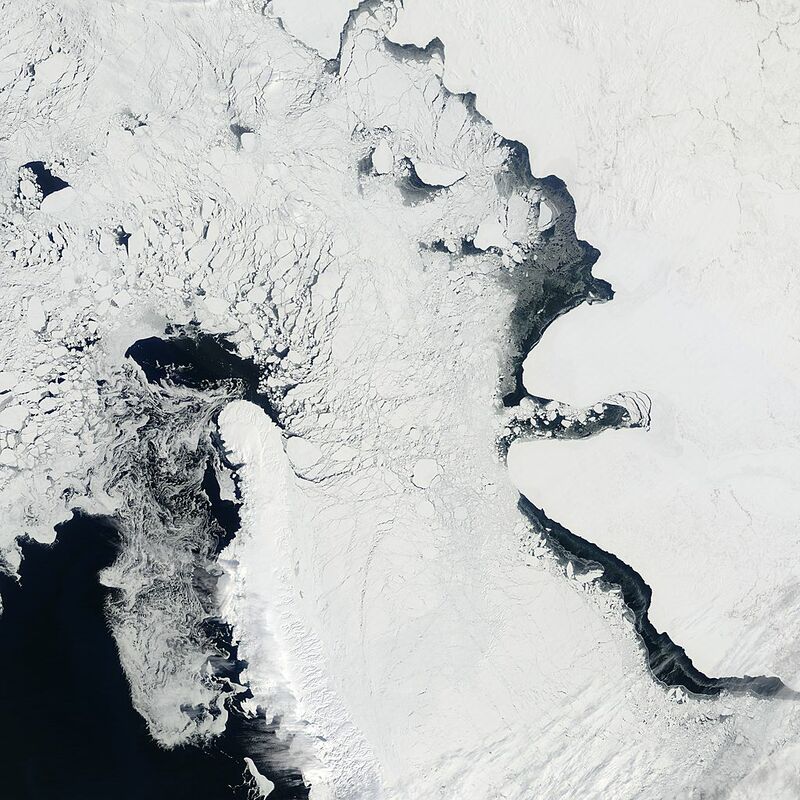 The combined impact of constant sunlight, above-freezing water and rising air temperatures is starkly visible in this most recent Lance-Modis satellite shot of a region of the Barents and Kara Seas. This region shows rapidly fracturing ice with numerous expanding polynas as regions of open water creep northward. In large regions, newly open water shows no sign of surface refreeze and instead has rapidly invaded the weaker ice. Such conditions are now common in many regions near the ice edge. 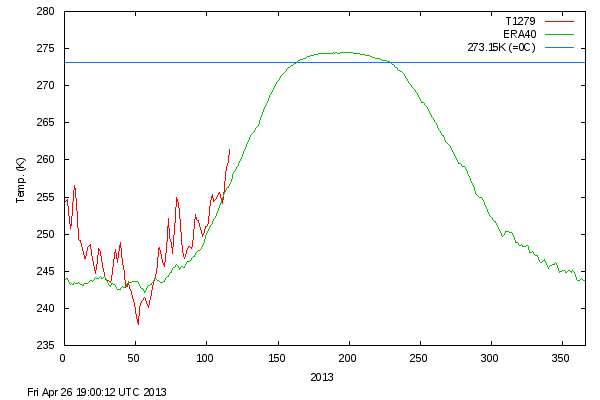 Overall, the Arctic has now entered a phase which shows increasing risk of rapid to very rapid melt. High temperatures, warming and above average ocean temperatures, continued invasions of warm air, rapid snow melt in Siberia and expanding regions of dark, sunlight absorbing water all will likely conspire to speed melt in the coming weeks. So the forecast is for moderate to rapid (and possibly near-record) melt over the next 7-14 days. 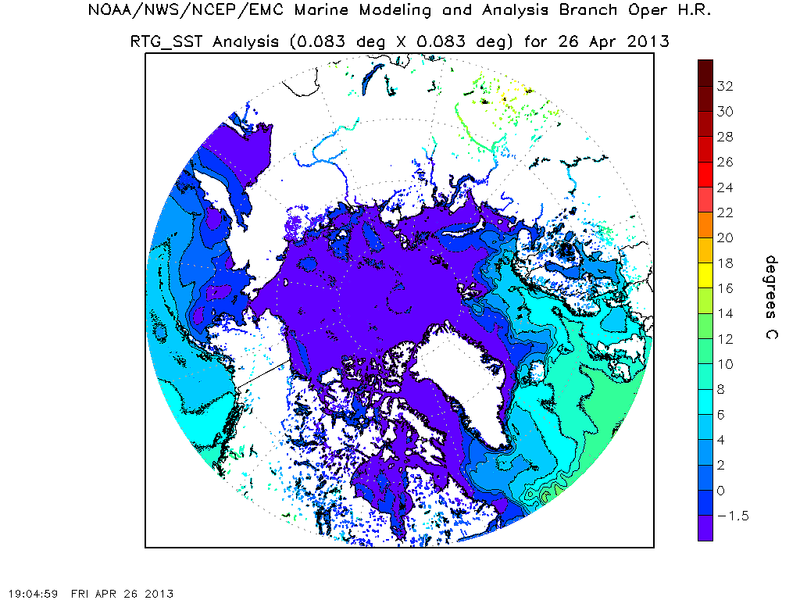 One caveat is that the Beaufort Sea has remained cold and that Arctic Oscillation has remained positive. The result is that risks for a rapid Beaufort melt appear to be lower at this time. However, ongoing moderate new re-cracking north of the Canadian Arctic Archipelago may render this, somewhat comforting, observation premature. 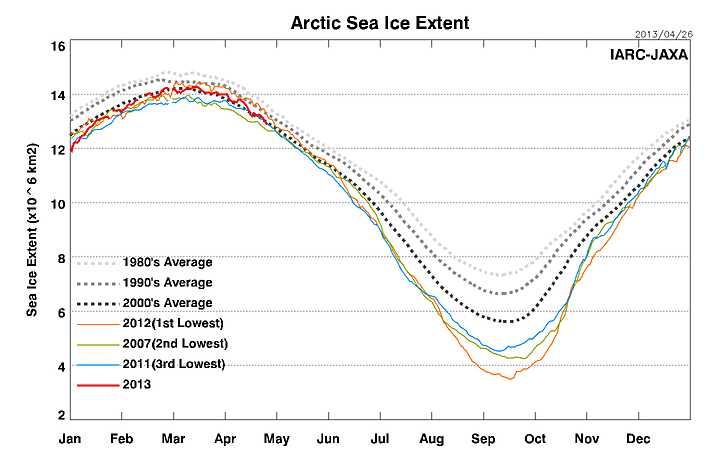 Overall, sea ice melt appears to be on pace to hit or rival most recent record lows. Our forecast remains that there is a high (60%) likelihood that either sea ice area, extent, or volume will reach new record lows in 2013. There is a moderate risk that all measures will show a new record low by the end of this year (35%). And there remains a low but significant risk that the Arctic will be essentially ice-free by the end of this summer (20%). Chances for total ice melt (an event that likely hasn’t occurred in the past 400,000 years), as noted in previous posts, remains low at 10%. As the melt season progresses, we will continue to refine predictions and global risk analysis. It is worth noting that no year since sea ice record keeping began has ever shown risk of total or near ice free conditions. So the 2013 melt season is already a historic one in that respect. Finally, as noted in previous posts, risk for total melt or near ice free conditions continue to rise over the coming years.